Each day, Doug and I would run the same pace; that is, we’d run stride for stride — in that sweet spot — where we could still share stories without enduring too much shortness of breath. However, in the last 100-200 yards, Doug would crank up the pace until he appeared to be going all out. The first few times he did this, I thought he was just trying to finish before me. But that wasn’t it. Not at all. He was committed to finishing strong. I decided to apply this to my run training. At the time, I didn’t have a reason for doing it, other than the fact that it would compel me to briefly reminisce over good times in Key West. I even called it “The Doug”. I’d get to the little 1/4 mile hill on which my house resides, and I’d think “Okay, it’s time for The Doug”. Then, I’d dig as deep as I could (even if it was at the end of a 17 mile run), and I’d muscle my way up the ascent until I was squarely in my driveway. Years later, I won the opportunity to be mentored by Kurt Madden (2-time Ultraman World Champion). Many times — more than I can count — Kurt told me to finish strong. “Increase your cadence, your foot speed,” he’d say. “Make sure you do that in the last mile or two of your run”. Unlike Doug, who never shared his rationale for picking it up at the end of a run, Kurt made his reason clear: at the end of an Ironman, you have nothing left. You’re spent. You’re running on empty. So train your legs to find foot speed at the end, when they haven’t any left. Do this in training so you can finish strong when you race. So I’ve been doing this. I’ve been doing “The Doug,” and after meeting Kurt, I’ve simply increased the distance from where I begin to pick up the pace. 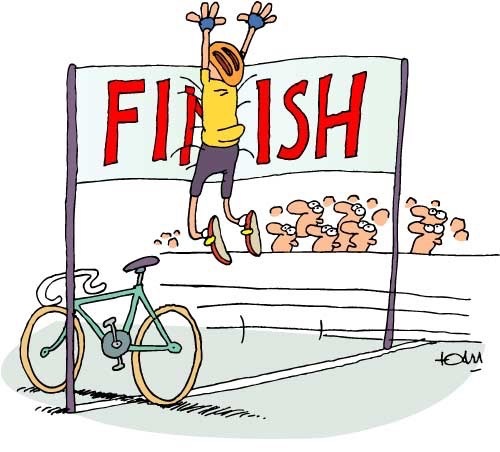 I’ve since learned, however, that those two words, “Finish Strong,” crossover quite logically to other things. For instance, on Mondays and Wednesdays I deliver four back-to-back lectures (each is approximately two hours long). Invariably, I am exhausted by the time I get halfway through the fourth lecture. Exhaustion, for me, leads to a decrease in patience and passion. Of course, should I have a bad experience in my fourth lecture, or should I “phone it in” without giving a true 100%, it will bother me for the rest of the evening, and it’ll likely be the last thing I think about before I fall asleep. I’ve learned to bring “The Doug” into my fourth lecture, for regardless of how well the other lectures go, I’ll beat myself up over my mistakes if I don’t finish strong. The application of this strategy is attractive because it applies to so many things. It’s not just the end of a training run, or the last lecture of the day. It’s the last few words you say to your wife before you kiss her goodnight. It’s the way your eyes look when you say “pleasant dreams” to your kids. Finishing strong can lead to greatness. Not finishing strong can lead to regret. You make the choice. This is a great article and a great strategy. Thanks for sharing!